Lamelle has just released the latest issue of their magazine Lapelle. 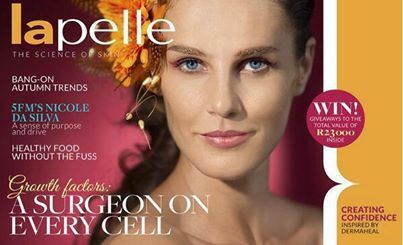 Lapelle gives authoritative and scientific perspective to skincare to help build the professional skin care industry. Lamelle Research Laboratories is a South African biotechnology research company that manufactures products that are innovative and evidenced based. Started 7 years ago, the founders combined over 25 years of medical and pharmacy experience to bring a unique perspective to the industry. Their core business has been in medical aesthetics and all of Lamelle Research Laboratories’ products are developed through a rigorous programme of review, research and meticulous production.